But Uber’s growth among business travelers got lumpy. Rideshare companies – mostly Uber, but now also Lyft elbowing into the scene – are changing the way business travelers look at ground transportation. In the process, these worker bees, who’re spending their company’s money, are not only crushing the taxi business but also that end of the rental car business. The collapse of business travel spending on taxis and rental cars is just stunning. And there is no turning back. Uber’s and Lyft’s combined share of the ground transportation market in terms of expense account spending in the second quarter has soared to 63%, with Uber hogging 55% and Lyft getting 8%. The share of taxis has plunged to 8%, now equal with Lyft for the first time, according to Certify, which provides cloud-based expense management software. 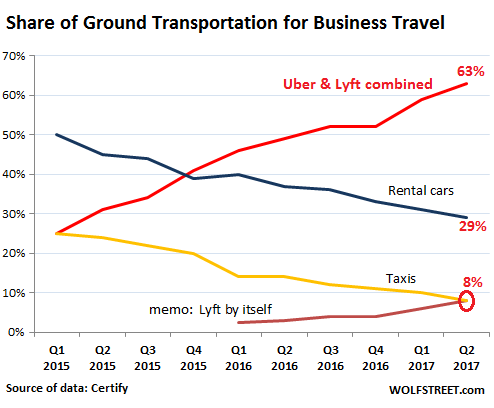 Uber hit that point in Q1 2015, when expense account spending on Uber matched spending on taxis for the first time, each with 25% of the market; rental cars still dominated with a 50% share. But that was an eternity ago. Note that the share of rental cars and taxis has declined at roughly the same rate. Uber’s growth in the business travel ground transportation market has continued despite its constant drumbeat of intricate debacles in the news, but the rate of growth has slowed. And Lyft’s rate of growth has surged. The chart above shows this surge in the growth rate of Lyft, which caused its share to jump from 3% a year ago to 8% now. In analysis of major U.S. metros, taxi also lost ground in all but Miami and Atlanta, while Lyft picked up share everywhere but Miami where receipts and transactions were flat on the quarter. Conversely, Uber lost between 1-6% in every city but Chicago where the ride-hailing leader gained 1%. “Bad situation with a flight canceled, best thing was to take a one-way Uber from Wilmington to Charlotte Douglass airport” ($210.07 expense). And that would be a new trend, with consequences for the hotel sector, airlines on short hops, and other travel services. Taxi companies and rental car companies have to at least break even in the long run, or else they’re toast. Uber and Lyft don’t have to worry about the long run yet and have no such constraints. They’re burning investor capital as fast as they can and as they see fit to become heroes. During the last round of funding, Uber was valued at $68 billion and Lyft at $7.5 billion. Neither might ever be able to make any money, given their pricing structure with which they undercut taxis and rental cars, and their high expense structure. But if they could shed their human drivers? That’s why rideshare companies spend a ton of money on the shift to autonomous cars. Mass-production is years away, and lots of hurdles remain. So this spending will have to continue for years. But with the large amounts of money rideshare companies – and not just those in the US – have raised, they’ll be able to trip up related and unrelated sectors — long before autonomous cars become a mass-produced piece of equipment. Overall car ownership might experience “negative growth,” as more people in densely populated urban areas might decide that it’s easier and cheaper to pay per ride when needed, and use mass transit at other times, or use a combination of both, rather than paying 24/7 for the overall expense and hassles or owning, driving, parking, and maintaining a car, including paying for tickets and taxes. And they can text legally while being driven. Some of this is already happening. it would push rideshare companies’ impact on the economy far beyond taxis and rental cars. The entire auto industry is already looking over its shoulder and rethinking its business model. In 10 years, if GM and Ford (and others) are smart, it will be they who replace Uber and Lyft in the autonomous taxi business running their own fleets around the world. Rental companies will either go out of business (probably) or adapt by doing the same thing. But there won’t be enough room for all so some of them will die. But the present model of selling cars to individuals will be practically obsolete in 20 years when car sales plunge to 50% or less of what they are today. Yes, I think that’s GM’s and Ford’s plan – to muscle in on the rideshare-driverless-car combo. Ford has created its “Smart Mobility” unit for, among other reasons, exploring this concept. They know their world is changing, and they want to remain key figures in it. Yes, adapt or die. Another area where this will have a huge impact will be on auto mechanics and parts stores. With car ownership collapsing these two very profitable businesses will shrink dramatically. Also, another thing to consider is that the built-in obsolesce of modern car manufacturing will disappear. Maintenance will be the single greatest overhead expense of an automated taxi service so cars that are designed to last 1,000,000 miles or more will become the order of the day. This will have a dramatic effect on the entire manufacturing chain with very few cars needing to be built or replaced. Add to this an increase in manufacturing automation and we could easily see an 80% reduction in employment in the entire auto industry. America’s greatest manufacturing industry and employer will be reduced to practically nothing. Good info, thanks. I think i will look into some puts on these areas! so i don’t become obsolete! Mucho! Milking Institute – That was excellent! Great from the hand painted backgrounds to the singing to the soundtrack. In other “otto” news, I was out busking in Mountain View again and I saw, again, one of those white cars with some blue logo with a W in it on the side, with some kind of camera gadget on top, going by. I wonder what those are up to? Practically speaking has it not already been reduced to nothing. It thrives on one dollar an hour Mexican workers and the ability to import to the US tariff free. The US auto industry is a financial and marketing arm of Mexican manufacturing. I am speaking as an ex worker at Ford in Mahwah, N.J. An assembly plant long gone. The UAW should have negotiated the ability to organize in Mexico as well. How the US or anytone thought that NAFTA was going to work without equal labor rights is beyond me. Planned obsolescence will still be job #1 at Ford and GM like it is today. Maybe not so with the new corporations that specialize in autonomous and eat everyone’s lunch. Those Lyft & Uber cars require maintenance also. Cab companies change the oil in their cars every 2 weeks. Thanks for the clip, Milking Institute: “Yesterday’s Tomorrow” and it’s Glorious Future are always good for a mordant smile. And … I’ve solved the mystery of the white cars with a logo that has a W in it … they’re something called “Waymo”. So, new name for Google self-driving cars. Probably good, because if Google-labeled self-driving cars were buzzing around, people would probably stop them to ask them questions. Automated cars don’t work well in cities where it snows. The cost to upgrade entire cities so that automated cars stay in the correct lane or don’t run red lights would be very expensive. I have noticed that in cities with Uber, people drive less. In regions that depend on car manufacturing and the businesses the workers from those factories support, I wonder what the long-term effect would be of these jobs disappearing if people buy fewer cars. You’re forgetting global warming–what snow? They changed the term to climate change to reflect the fact that the Earth does not have to warm to have unintended consequences to the environment. Every year, there are cities around the world that get above average snow, rain and days without a lot of sunlight to charge solar products. Currently, the automated cars in my area, need to see the lines on the road to drive in the right direction. If you build a car that only works best for the average weather expected for that city, and one year you get too much rain or too much snow and the car can’t see the lines on the road to guide itself into the right direction, then the whole city will fall a part, if they don’t have a backup plan. I already stay home when it snows. Humans cannot drive well in it either. If autonomous cars cannot handle snow, snowy areas will be more expensive to live in and more people will move south. the industry is embracing self driving cars. If you miss a car payment your vehicle will drive itself to the repo lot. Is there any data on how rideshare is doing outside of the major population centers? I am thinking 200,000 population and smaller – population numbers outside of the top 100. This doesn’t sound like the real world. Maybe some mythical land in which everyone has high-earning jobs with “companies” and does everything on their iPhones…? Might wash in “expense account land” but for the rest of us in small town, flyover North America, well…what IS “Uber” anyway? America is aging rapidly and downsizing too. I can see car ownership dropping drastically as the baby boomers retire. As their incomes become fixed they don’t need expenses bound to keep rising. I was watching a Galloway video on tech companies and he quipped that Uber loses so much money on each ride, it was socially irresponsible not to use them. Petunia, that last paragraph is priceless!! Galloway actually said it was economically irresponsible not to take Uber if it cost them $75 to get you to the airport but they only charged $50. I think you could argue that it is actually socially irresponsible in the long term. A bit like when Milo Minderbinder finally ties up the whole planet and then, as Prof Damodaran says, adds another ‘9’ to the price of Amazon Prime. Too late then because where else you gonna go? So many keep expecting inflation while costs are ruthlessly stripped from the economy. I find it funny that everything is being sold in small slices through the use of technology. A most interesting investment environment where everything is billed in 6 minute increments like attorneys. Now, what happens when uber dies from excessive overhead? After all, it is just an app, and if Lyft can do it better, then they win. Or what happens when Amazon versus Google really gets going with ultimate jitney JIT technology, when the car arrives with full entertainment suite and self drives to the destination. Kinda kills Tesla, unless they do the same. Like Walmart. Right now people are buying cars through crappy financing to drive for Uber, but they must simply commit 60 hours a week to the most lucrative routes. Now, how much is a house going to be worth when people who no longer have high incomes need the equivalent of a flophouse- $120 a week. I guess $120xbedrooms- insurance and taxes. Boomer social security math, everyone expecting inflation in anything should look at those social security retirement payments and contemplate how small that income stream really is, and how stupid asset holders are to expect greater returns. They should expect a sharply contracting national income over the next 20 years. Stunning when you think about it, stagnant wages, declining household total incomes, leaving assets to fill the gap? Current age 64….The belt only gets tighter from here…. Some day this war is going to end. The “war” is being run by a bunch of four star clowns who are gonna end up giving the whole circus away. LoL- the four star clowns now run the show in Afpak, and the results will be predictable. Leaving Kabul late this year to avoid election images in 2018, or wait until January 2019. Lah. The music has started, and now we have a Col. Kurtz running the white house by twitter. The country is now going up the river, and it will have to get out of the boat and go all the way. End of empire is upon us, and it won’t be pretty, and so now we duck back below the event horizon and get comfy to watch the show. …methods became unsound… a motto for our times. Nice to see that you have not lost your sense of humor since the demise of CR comments. Look forward to many more of your posts. I was wondering if anyone would catch the reference. Thanks for the memories folks, I will drop by from time to time. Working full time again, and staying clear of big time sinks online. But the stresses are building up again, and this time it is going to be even worse than last time is my guess. After all, Yellen is going out at the end of her term, and John Taylor will be on deck. I expect Fisher to quit out of frustration, and Fed policy to be decided by desperate measures. In short, without more domestic wage growth, we are still screwed. And the Trump stimulus is dead, unless he learns to go full populist. So far he is an utter failure, but he has tried to be a conventional Republican, which is the politics of failure. In short, I expect no real inflation, only higher prices where there is monopoly pricing power. And where there is no pricing power, ruthless cost cutting is the name of the game. We grow poorer, so we can shrink the labor pool and reclaim our drug addled surplus labor through deportation, or we can spend a tremendous amount on socializing medicine. Raising tariffs is going to be a shock to the system and will cause price increases until domestic production fills the gaps. I do love how employers are complaining about how the youth of America doesn’t want to work. I guess we need more starvation in America to get the serfs to be compliant. 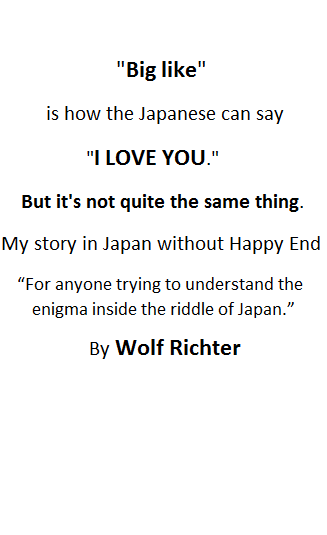 Excellent analysis, Wolf. Top notch. Every so often a new idea comes along that proves popular and becomes a disruptive industry. Some people mourn the loss of the obsolete because they have short memories, forgetting that the obsolete would once too have been a new idea. Everyone may have the right to work but there is no obligation for everyone to be given a job. Most people take a chance by becoming employees and committing to expenditure that depends upon job security. We should remember that. Self driving cars are still basically a novelty, but in ten years? Who knows. They will not go anywhere. Just smoke and mirrors to lure more stupid money into uber and the likes. True you could basically have fully autimated trains today but trains don’t generate such a big bubble, right? Not to mention that without a conductor it would be 100% the company fault if anything happens. There are already numerous subway lines that operate without anyone but passengers on board. That technology – including the sensors to hit the brakes when someone jumps in front of the train – has been around for years. It’s kind of spooky at first, but you get used to it after about five minutes. I dunno, every time I go to the airport I ride a driverless tram; have for decades. Would a driverless subway really be much different? These are quite common in France — at the airports for instance and in Paris there is one automated route (without drivers). Given the accident risk when drivers are looking at their damn smartphone texting someone, they might actually be safer. The technology in any case certainly exists. The main deterrent in many places will be the unions. Yesterday ( Sunday) morning, I had to get to the Lincoln, NE airport at 4 AM to make a 6 AM flight. On Saturday, I asked the hotel clerk to arrange a cab for me. The drive showed up at 4 AM and I was at the airport at 4:30. The cost was $27 with tip. I would never have taken a chance with Uber or any other kind of driver. I had to make the flight. I wasn’t worth trying to save $5 or 10 Dollars. The hotel uses reliable cab companies and it all worked out. Would you like to hear how often in my life taxis that I’d reserved the day before didn’t show up early in the morning to take me to the airport? For that reason, I now avoid taxis to go the airport early in the morning. There are usually other means available. (In San Francisco, our biggest shuttle service works great… everything is done online… they pick up at the door, though the ride takes a little longer since they also might make one or two more stops, and it’s cheaper for one or two people than a taxi). Uber is just the latest addition. Minneapolis has light-rail service from downtown to the MSP airport. During morning and evening ‘rush hour’ times the cost will be $2.50 ($2.25 now). Otherwise, it will be $2.00. St. Paul is exploring options for a direct transit line from it’s downtown to MSP to complete the triangle between the two cities and both the Mall of America and MSP. When the thousands of visitors arrive for the Super Bowl in February, this will be a great option. We’ve got the #10 “Airport Flyer” bus that goes around in a loop, to the San Jose airport, the Santa Clara train station which also is a stop for the #22 bus which runs 24/7, and the Airport/Metro light rail station. The #10 bus is free, too. in Lincoln NE you can hear the corn growing at midday. My point was this: the hotel has a relationship with a cab company. If their driver screws up, no more business from the hotel. I had the hotel’s leverage – Marriott has 4 hotels in Lincoln. As an individual, you have no leverage – no nothing, unless of course you are employed by a big Wall Street outfit. H&M (H & M Hennes & Mauritz AB) is a Swedish firm. They were originally entrenched in Scandinavia but have greatly expanded worldwide in recent years. Any ride you are the passenger only, not the SOV passenger/driver, is autonomous. Door to door is the perfect trip when free to safely do something else. This not ridesharing, defined in most State codes to enable carpools and vanpool to pay expenses without a commercial carrier licence or business license. Humans are autonomous and can pilot all types of vehicles. The best units are drawn into service by fair pay. My uncle was a limo driver and in the 1950s drove five ABC TV execs from Baltimore’s Friendship airport to NYC because weather had grounded flights. His tip was $125 he said. Using tech to match ride need to provider automates dispatch. Deadheading can never be eliminated. Autonomous vehicles won’t solve that. Equipment is always wearing out and depreciating. AVs no help there either. When the fleet is depleted, “My Kingdom for a cab” will often be said. Change comes at a price. Electric cars are predicted to be with us in a substantial capacity by 2030 – are we ready ? Will we have to carry a charger & an very long electrical extension cord with us – will that come with camping equipment ? Out with the old & in with the new – these are exciting times – we are actually privileged to be here to witness this remodel of life on planet earth. It is End Time – an apocalypses is in play. I took a ride with an Uber driver in London who was worried about how changes in English Law re handing a phone while driving becoming a more expensive offence in ters of fines/points could end drivers careers. I think personal owned cars are beloved by their owners for trips to shops, ferrying kids and elderly parents and FREEDOM. I suspect like the Visa dominated drive to create a cashless society this wont happen anytime soon. Ride-sharing. Uber. Lüft. Bottom line. People have no money for cars. They rent time and space in a vehicle. People have no money for houses or condos. They rent time and space in a building. Poor people can not afford furniture. They rent the stuff and pay usurious rental rates. Eventually, 65% of the US population will be in rental mode. May rent their clothes too. They can not afford to own anything. As a very smart friend of mine – a successful surgeon – going on his fourth marriage – said to me – see this new BMW 700 something – I lease it because I can not afford to own it.